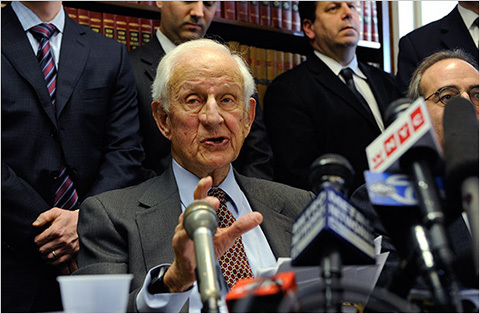 The veteran crime-fighter Robert S. Morgenthau, formerly Manhattan District Attorney, has an excellent article in the New York Times with the above headline. It's an alluring argument, at least for those who want to believe it, but it falls apart on analysis. "The favorable tax rates encourage corporations to avoid paying American taxes by structuring complicated international transactions, like Apple’s “Double Irish With a Dutch Sandwich,” recently described by The New York Times." "Follow the trail of nearly any major financial scandal and you will enter one or more of these notorious jurisdictions." Quite so. But here is the underlying problem. Tax havens offer an escape route from whatever it is that (mostly wealthy) individuals and corporations in onshore jurisdictions don't like: escape from the responsibilities of civilised society. Now countries like the United States put in places defences against these escape routes: so for example, even though you may earn income in a tax-free offshore tax haven, you are still required to declare and pay tax on that income. These defences are a bit like strands on a sieve: each strand catches something, and the sieve overall stops the haemorrhage from becoming a free flow into the black hole below. Some countries' sievevs have thicker meshes than others, and catch more. Each time you put in place a new strand in your sieve, you hope to catch a little bit more. But also think about a particular hole in a sieve as a square, bounded by four wire strands. To attempt to plug that hole, you might put in two thick new wire strands in a x-shape, crossing that hole. Now you now have a reduced area for leakage - but you have also created four new (smaller) holes. In tax terms, that means four lucrative new opportunities for the pinstripe army of accountants, lawyers and bankers who make the system work. Adding strands on the sieve is usually better than doing nothing, but it isn't ideal, and this approach leads inevitably to tax systems of increasing complexity. To address the problem, it is essential to plug up those black holes underneath the sieves. And that means cracking down on the tax havens themselves. They are not blameless scapegoats, as they love to claim. They are the foundation of the problem. "Everyone knows that Bernard L. Madoff worked in New York, but the funds that secretly fed his Ponzi scheme favored more exotic offshore locales. These funds looked like independent hedge funds, but were in fact merely conduits that funneled investor money to Mr. Madoff and furnished no information to the United States Treasury or regulatory authorities. Because the ownership of these funds was such a tightly guarded secret, now not even the Madoff trustee can figure out who should be sued to recover illegal profits — and who are victims entitled to restitution." "Despite the alarming evidence that these losses have only been made possible due to the fraudulent behavior, at least the gross neglicence, of the aforementioned Luxembourg entities, none of these institutions has been held accountable to date." This is not a tax issue - but the general sieve principle still applies. While these hothouses for crime and abuse are in existence, no amount of onshore lawmaking will be able to stop the problem. Go after the problems at their roots. Tackle the tax havens. So your suggesting that these tax havens simply close their doors for foreign capital and return to the dark ages in benefit of the so called developing countries? Your playing a pseudo Government role and hiding behind false arguments. Simply admit that you want to have control over the Government cash flow so that you can redistribute the wealth as YOU see fit.